Saputo Cheese USA Inc., announces the launch of Stella Fontinella Rubbed Wedges. Stella Fontinella Rubbed Wedges are hand-rubbed to create four unique flavors: Basil Pesto, Black Pepper, Bourbonista (bourbon-type coffee seasoned) and Harissa. Fontinella cheese is known for its delicately smooth and creamy taste with just a hint of sharpness. The cheeses come in 6-ounce wedges. HighKey Snacks introduces Cheese Crunch. Founded in 2018, HighKey Snacks is committed to using only pure, wholesome ingredients that don’t require adding chemicals or unpronounceable extras. Made with only simple, clean ingredients—cheese, egg whites and seasonings--new Cheese Crunch lets consumers fill up on great taste without slowing down. The keto-friendly, gluten-free, high-protein snack is making its debut in five varieties. They are: Cheddar Cheese + Egg Whites, Cheddar Cheese + Egg Whites + Bacon, Parmesan Cheddar + Egg Whites, Parmesan Cheddar + Egg Whites + Everything Spices, and Goat Cheese. The shelf-stable snacks are sold in 2-ounce packs, with a 1-ounce serving containing 180 calories, 12 to 14 grams of fat, 12 to 14 grams of protein and no sugars. 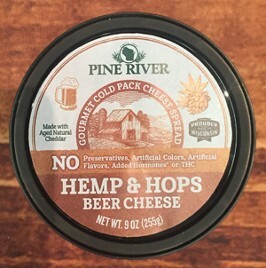 Pine River introduces Hemp & Hops Cheese Beer Spread. In keeping with the over-arching theme of hemp-derived CBD products at Natural Products Expo West 2019, Pine River showcased its cannabidiol (CBD) infused all-natural cheese spread that is ready for market as soon as hemp-derived CBD gets federally approved for use as a food ingredient. Pine River’s cheese spread is made with aged natural cheddar cheese and contains no preservatives, artificial colors, artificial flavors, added growth hormones or the psychoactive compound delta-9-tetrahydrocannabinol (THC), which is stated on front panels of the 9-ounce tubs. The CBD does not contribute any flavor to the cheese spread, which has a cheddar beer taste profile. Dairy Farmers of America (DFA) introduces Craigs Creamery.Reinforcing its commitment to increase demand for dairy and bring more value to its members, DFA, along with eight New York-area farm families, recently launched a new cheese brand, Craigs Creamery, which provides a direct connection to the farm. From milk that goes from cow to creamery within hours, to farming that focuses on environmental responsibility, the family-run farms of Craigs Creamery are committed to providing the best, freshest, New York dairy with respect for the land. Every Craigs Creamery slice, shred, bar and chunk is crafted with high-quality milk, all-natural ingredients and no added hormones. Made with only locally sourced milk from local family farms, Craigs Creamery believes the purity and freshness of its milk is critical to producing a higher-quality cheese. “As a small collective of family farms, we keep a close eye on the purity and freshness of our milk. Each cow has a customized, nutritionist-led diet to ensure they produce only the highest-quality milk, which results in our great-tasting, award-winning cheese,” says Chris Noble, a seventh-generation farmer at Noblehurst Farms, a Craigs Creamery farm. “Fresh milk is picked up from the farms daily and delivered to the creamery, which is located just a few miles from where the cows are milked.” The farm families maintain the tradition of family farming while incorporating the forward-thinking, innovative practices of modern agriculture. One of the farms features a state-of-the-art biodigester that powers the creamery. It is the only digester in the U.S. that fuels an on-site plant. The digester is powered by animal waste, which also is used to fertilize the fields, along with expired food from the local community. In the past five years, it has upcycled nearly 20 million pounds of food scraps that otherwise would have gone to a landfill. 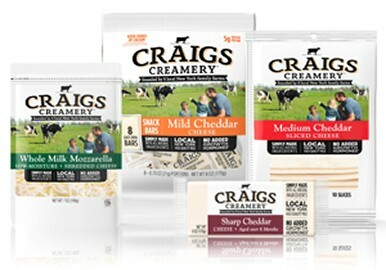 Craigs Creamery offers a variety of product options, including Whole Milk Mozzarella, Swiss, Mild/Medium/Sharp Cheddar and Muenster cheese, which are available in slices, shreds, chunks and snack bars. 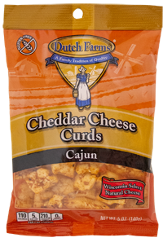 Dutch Farms introduces snackable cheese curds, as one of 22 new products being launched in 2019. The bite-sized cheese curds come in 5-ounce sharable snack packs in three varieties: Cheddar, Cajun Cheddar and Garlic Cheddar. Other new products from the Chicago-based dairy include three varieties of Dutch Farms On The Go Snackers, which are multi-component packs of three Snackers that include a combination of cheese, dried fruit and nuts. 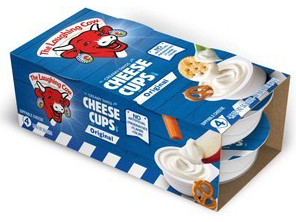 There’s also new Dutch Farms On The Go Snack Packs, which are 0.75-ounce individually wrapped single-serve portions of either Mild Cheddar or Marble Jack cheese that come in 10-packs. To read more about snackable forms of cheese and how they fit in today’s lifestyle eating regimes, link HERE. Tillamook County Creamery Association introduces Tillamook Cheeseboard. The new product line is part of the 110-year-old farmer-owned dairy cooperative’s package refresh and logo redesign. The premium snacking combo packs feature cheese, crackers and fruit spread. The line is rolling out in select markets, including Denver; Portland, Ore.; Seattle; and Spokane, Wash.
To read more on the new product line as well as how 110-year-old Tillamook is keeping its dairy products portfolio relevant, link HERE to a Food Business News article. To read more about this product, link HERE to the February 8, 2019, blog titled "Dairy Foods’ Role in Lifestyle Eating Regimes." Kraft Heinz introduces Taco Bell Shredded Cheese. The Taco Bell brand can now be found in the dairy department’s cheese case. The new 7-ounce packs of shredded cheese come in five varieties. 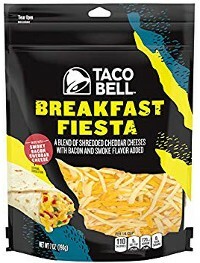 Breakfast Fiesta is shredded cheddar cheese with bacon and smoke flavor. Salsa Verde is shredded Monterey Jack, sharp white cheddar, sharp cheddar and mild cheddar cheeses with salsa verde seasoning. Taco Night is simply shredded cheddar cheese. Zesty Ranch is shredded Monterey Jack cheese with ranch seasoning. 7-Layer Blend is shredded asadero, mild cheddar, sharp white cheddar, Monterey Jack, low-moisture mozzarella, sharp cheddar and queso quesadilla cheeses. The suggested retail price in $3.49. Schuman Cheese introduces Cello Copper Kettle Chisels cheese. Chisels are bite-size pieces of one-of-a-kind Copper Kettle Parmesan, which is crafted in copper vats for unparalleled authenticity and distinctive notes of cooked caramel. With 9 grams of protein and 110 calories per serving, Copper Kettle Chisels make the perfect health-conscious snack, according to the company. The 5-ounce uniquely shaped and colored resealable cups are ideal for nibbling on the go. The cups sell for $4.99. Dairyfood USA introduces Glacier Ridge Grab n’ Go snack packs. 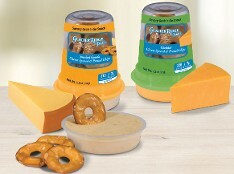 The new dome-shaped containers have shelf-stable cheese spread in one part and pretzel chips in the other. The new snack pack comes in two varieties: Cheddar Cheese and Smoked Gouda. The snacks have an ambient shelf life of six months. 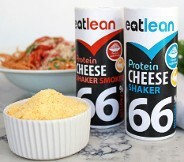 Made with 100% natural cheese, each pack contains 220 calories and 7 grams of protein. To read more about this product, link HERE to the January 18, 2019, blog titled "Dairy Foods Winter Fancy Food Show Takeaway: It's Time to Get Seedy!" 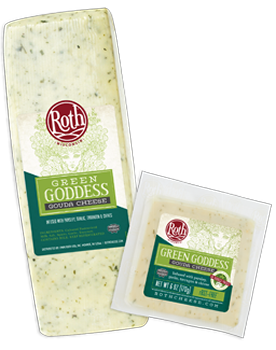 Emmi Roth introduces Roth Green Goddess Gouda cheese and The Goddess Project. The new Wisconsin original is Roth’s traditional Gouda carefully infused with fresh herbs, including tarragon, chives, parsley and garlic. To celebrate the debut of Green Goddess Gouda, Roth Cheese is donating a portion of retail sales of Green Goddess Gouda to The Goddess Project, a new organization established by Roth Cheese to help empower community leaders to turn their ideas into actions. This new Gouda cheese joins the company’s array of Dutch-style Gouda varieties, such as Roth Original Van Gogh Gouda, 3 Chile Pepper Gouda, Sriracha Gouda, Natural Smoked Van Gogh Gouda, Vintage Van Gogh Gouda and Roth Organic Van Gogh Gouda. Roth Green Goddess Gouda is available in 7.5-pound loaves and 6-ounce retail cuts. P.S. 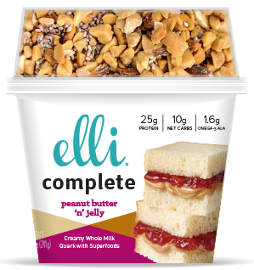 Let’s Eat Inc., introduces Elli Complete. This creamy whole milk quark—a fresh cheese made using an authentic German recipe—comes in a dome cup loaded with superfood inclusions for the consumer to mix into the no-added-sugar flavored quark. Each single-serve container provides 20 to 25 grams of protein, 9 to 12 grams of net carbohydrates and 1.6 to 3.9 milligrams of omega-3 fatty acids. The product is making its debut at select Target stores. 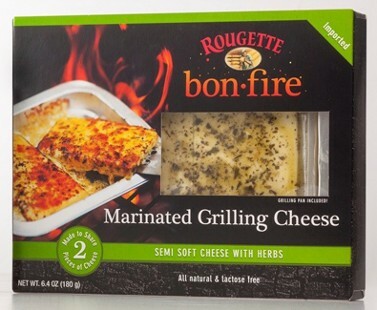 Champignon North America introduces Rougette Bonfire Grilling Cheeses. As the days start to get longer and hopefully the weather warmer, people start firing up their grills. The latest cheese innovations from Käserei Champignon are served hot, fresh off the grill and are perfect for sharing. 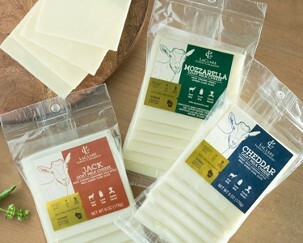 The product line includes two types of cheese made with all-natural ingredients. Mild and creamy Grilling Cheese is made to be heated directly on the grill, just like a burger. The creative cheese masters of Käserei Champignon have refined a recipe for a soft-ripened cheese that can withstand the direct heat without melting or sticking to the grill. The cheese develops a char-grilled, golden crispy outside and a warm and creamy soft inside. Marinated Grilling Cheese is a savory and creamy semi-soft cheese pre-marinated in herbs and oil and comes in a convenient aluminum pan for easy preparation and grilling. The cheese softens when warmed and has versatile party menu applications. It can be warmed on both sides and diced into salads; layered with grilled vegetables for one-pan main course; or melted into a hot dip, perfect for a crowd. Known predominantly for its premium deli-counter and pre-packaged deli meats and sausages, Dietz & Watson is growing its snacking cheese range, which will be marketed under the new Dietz & Watson Originals brand. These items are all “no antibiotics ever” and include some organic options, tool. From high-protein charcuterie snacks and beef jerky to artificial growth hormone-free cheese curds and medallions to fire-roasted vegetables and imported pouched olives, this better-for-you snacking brand celebrates the company’s 80th anniversary in 2019. 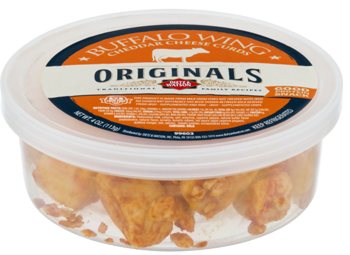 The line includes 4-ounce plastic tubs of cheese curds in four varieties: Buffalo Wing Cheddar, Fresh Cheddar, Hot Pepper Cheddar and Tapenade Style. The 3.75-ounce packs of cracker cuts come in Fontina, Jarlsberg, Mozzarella and Provolone varieties. There are also 4-ounce combo packs of meat and cheese medallions and mini paninos, which include pepperoni, genoa salami or prosciutto wrapped over mozzarella cheese. According to Deloitte’s 2018 Holiday Retail Survey, the past five years have seen an increase in consumer budgets for holiday experiences like entertaining, which now accounts for 40% of the average planned holiday budget. Emmi Roth’s new limited-edition Easy Entertaining Cheeseboard features a bamboo cutting board, cheese markers for serving and three of Roth’s most popular cheeses: Roth Grand Cru Reserve, Roth Jalapeno Havarti and Roth Original Van Gogh Gouda. The cheeseboard is a simple and affordable way for entertainers to impress their guests whether planning the menu for their own holiday gathering or purchasing a festive gift for a host. 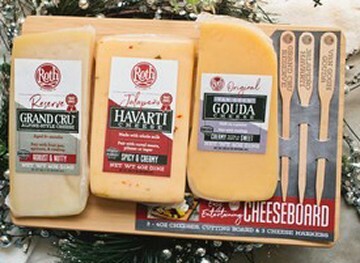 Each 4-ounce piece of Roth cheese has a unique flavor profile and comes with expert pairing suggestions. 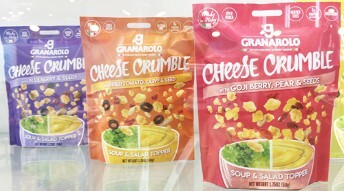 Granarolo Italian Milk and Dairy Group introduces Cheese Crumble. This new topper combines the company’s classic oven-baked 100% Italian cheese crisps with other flavorful ingredients, namely dried fruits and seeds. The topper is intended to be used in salads, soups or any food that can benefit from some extra flavor. Think cottage cheese and plain yogurt! 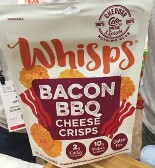 To read more about this product, link HERE to the October 26, 2018, blog titled "SIAL 2018: Dairy Foods Innovation Inspirations." Dutch innovator Spread-It rolls out namesake cheese with a circular innovation story. The company is all about total use of resources to fight food waste. Spread-it is a sustainable product, as it is made from 100% rescued cheese. This is cheese that can no longer be sold in the supermarket and it gets a second life from the company. The company says it picks up the cheeses from producers and supermarkets. Then it processes the cheeses into Spread-it, which then gets delivered to supermarkets. This is the circle around! Spread it comes in seven varieties. They are: Chili, Gouda, Herbs, Light, Natural, Mushroom and Tomato, Mushroom, Chili and Gouda. Schuman Cheese introduces Yellow Door Creamery Alpine Collection. The new line of cheeses was inspired by the complex and extraordinary flavors of cheese from the Alps. Careful attention is paid to each and every detail to create unique recipes that pay homage to the amazing cheeses of this region. The milk used for the Yellow Door Creamery Alpine Collection is sourced from four family-owned farms within 50 miles of the creamery, one being a third-generation farm that is home to a unique and special breed of Swiss cow. The three alpine-inspired cheeses are produced in small batches to ensure that every detail stays true to tradition. Each wheel is made in traditional copper vats. The cheese is hand-smeared and aged using traditional alpine-style, cave-aging techniques. 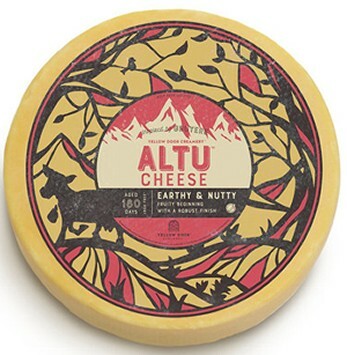 Altu, aged 180 days, has complex aroma and flavor that is fruity at first, with an earthy, nutty finish. Monteau, aged 120 days, delivers intense fruity flavors with a hint of butter and hazelnut. Valis, aged 75 days, is slightly sweet and nutty with a pleasant aroma. 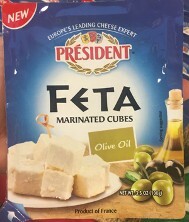 Chevoo grows its product line and expands distribution of olive oil-marinated goat cheese cubes. This California-based company was founded in 2015 by two Australians who grew up with olive oil-marinated goat cheese as a household staple. The couple were inspired to create a unique range of marinated goat cheeses in the U.S.
Chevoo is made from small cubes of pasteurized goat cheese that is marinated in flavored oil. Italian Black Truffle and Tupelo Honey and Lime are the newest offerings, joining Aleppo-Urfa Pepper and Lemon, California Dill Pollen and Garlic, and Smoked Sea Salt and Rosemary. The cheeses are perfect for slathering on bread, crumbling over salad or melting into grilled vegetables. 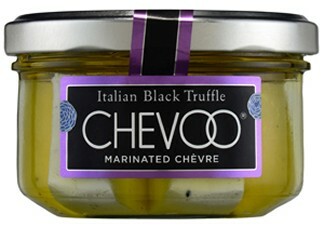 The name Chevoo is the combination of chèvre (ch) and extra virgin olive oil (evoo). The core ingredients—goat curd and olive oil—are sourced primarily from the abundant farm lands of local Northern California, and the spices, herbs, chilies and pollens are sourced from premium spice merchants across the country. Pour an Old Fashioned and pipe in some Sinatra. The mainstay of classic Wisconsin Supper Clubs—Kaukauna Spreadable Cheese--is turning 100! With a nod to its Wisconsin heritage and a step towards the future, Kaukauna is celebrating this milestone by expanding its product line and introducing new “no artificial anything” cheese balls. 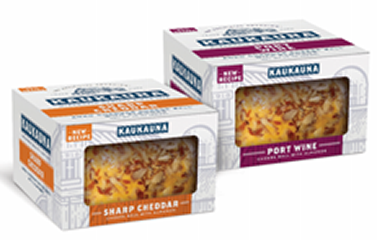 Available wherever Kaukauna is sold, the new 10-ounce balls will make their debut in the brand’s two most popular flavors: Sharp Cheddar and Port Wine. Other no-artificial-anything flavor varieties will roll out in 2019. Kaukauna invites everyone to celebrate its 100th year this fall and holiday season by hosting their own Kaukauna supper club party at home. Throughout October, the company will be sharing contemporary takes on iconic Wisconsin Supper Club specialties, including original recipes and usage tips. Move over pumpkin spice, maple is the new tasty trend this fall season. 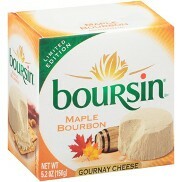 Bel Brands USA Inc., a subsidiary of Fromageries Bel, a family-owned cheese maker headquartered in Paris, France, is introducing limited-edition Boursin Maple Bourbon Cheese. This uniquely creamy, crumbly cheese has sweet notes of maple and rich hints of bourbon. Boursin Maple Bourbon is sold in the deli aisle of major retailers nationwide including at a suggested retail price of $5.99. Kraft Heinz introduces Cracker Barrel Dippers. 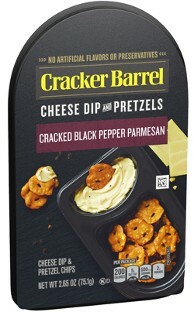 These new adult-centric snack packs feature a dippable form of Cracker Barrel cheese alongside a grain-based dipper. Cracked Black Pepper Parmesan Dip and Pretzels. This 2.75-ounce pack contains 200 calories, 8 gram of fat, 8 grams of protein and 1 gram of fiber. Garlic and Herb Jack Cheese Dip and Crackers. This 2.75-ounce pack includes mini whole wheat crackers that resemble Triscuits. A serving contains 220 calories, 12 gram of fat, 7 grams of protein and 4 grams of fiber. Jalapeno Jack Cheese Dip and Crackers. This 2.75-ounce pack includes mini whole wheat crackers that resemble Triscuits. A serving contains 230 calories, 12 gram of fat, 7 grams of protein and 4 grams of fiber. Sharp Cheddar and Pretzels. This 2.65-ounce pack contains 210 calories, 9 gram of fat, 7 grams of protein and 1 gram of fiber. Red Clay Gourmet introduces Dip ‘N Devour Snack Pack. The company’s award-winning batch-mixed, hand-packed pimiento cheese is now in a handy on-the-go snack pack. The new single-serve pack contains a hearty portion of classic Sharp Cheddar, Hickory Smoked Cheddar, Flame-Roasted Jalapeno or Sriracha Pimento Cheese Spread along with La Panzanella Mini Croccantini Artisan Crackers. The North Carolina husband-and-wife owned company uses locally sourced ingredients, when possible, to produce its unique version of this southern treat. For example, they source North Carolina-grown jalapeños and banana peppers. They are roasted and processed by hand. The non-GMO, cage-free egg mayonnaise is handmade weekly and used sparingly. Dutch Farms, a family-owned dairy, deli, meat and bakery company, is launching a new line of Thick Cut Shredded Cheese. These 7 or 8-ounce packs come in Mexican (four cheese blend), Mild Cheddar, Mozzarella and Sharp Cheddar varieties. Thick cut shreds invite customers to step up their already cheesy meals to the next level of cheesiness, according to the company. Dutch Farms newest addition to their shredded cheese line up joins three varieties of traditional shreds, 14 varieties of fancy shreds, and four varieties of recipe blend shredded cheeses. 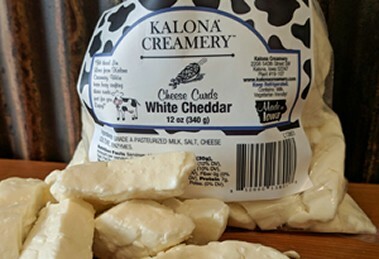 Kalona Creamery, a member of the Open Gates Business Development Corporation family, recently announced they are now making fresh cheese curds. This is the first time cheese has been made at this facility since Twin County Dairy closed its doors in 2014. To celebrate the return of squeaky curds, Kalona Creamery hosted a cheese curd launch party on August 11, 2018. This free, family-friendly event featured cheese curd samples, photos with Lona the cow mascot and a cheese curd eating challenge. In addition to the cheese curds, Kalona Creamery also serves house-made ice cream, sells hand-rolled butter, offers a lunch deli window, and features numerous Iowa vendors and unique gifts. Open Gates Business Development Corporation, known as Open Gates Group, is a family of eight companies based in the rural Kalona area. Companies include Kalona Creamery, Kalona Organics, Kalona Farms, Farmers Creamery, Awesome Refrigerated Transit of Iowa, Awesome Logistics, Frytown Distribution and Provision Ingredients. 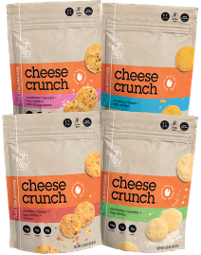 NutraDried Food Company introduces Moon Cheese Toppers. Using patented technologies, the company removes only the moisture from cheese while keeping all the nutrition and flavor to make Moon Cheese snacks. The company is now flavoring that cheese and offering it in smaller pieces than the snack version. 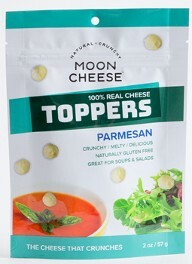 Crunchy Moon Cheese Toppers are positioned as a high-protein, flavorful garnish for soup, salad and other meals. Varieties are: Bacon Spiced, Italian Herb and Parmesan. A 2-ounce bag contains 4.5 servings, with a serving being 22 to 26 pieces. One serving contains 70 calories, and 5 grams of both fat and protein. It’s carbohydrate and gluten free, while being an excellent source of calcium. Bel Brands USA introduces Babybel Cheese & Crackers. The snack pack combo comes in three varieties. They are: Original with mini butter crackers, White Cheddar with mini butter crackers and Light with mini whole grain wheat crackers. Providing a good source of protein and calcium, Babybel Cheese & Crackers serves up a flavor-packed combination with as little as 90 calories, making snack time a little easier and a lot more balanced. “As families continue to snack more frequently and in more on-the-go occasions, it was a natural evolution to pair our already delicious cheese with its other half--the cracker--in a package that’s convenient for families,” says Shannon Maher, brand director of Babybel. Babybel Cheese & Crackers are available in 1-count and 3-count packs in the dairy aisle at all major retailers for a suggested retail price of $1.29 and $3.49, respectively. 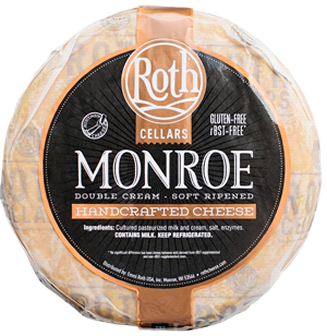 Roth introduces limited-production Monroe, a nod to the town Roth was founded in more than 25 years ago. 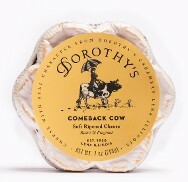 Made in approximately 1.6-pound wheels, the limited-production cheese is smeared and turned by hand every day as it ages for 30 days in cellars adjacent to Roth’s award-winning Grand Cru alpine-style cheeses. Crafted by cheesemaker Madeline Kuhn, Monroe is the only cheese of its kind made in Wisconsin. Monroe’s tender brine-washed rind is tan with hints of pink and tacky to the touch. The supple interior has a luxuriously creamy texture true to traditional double cream cheeses. Since each wheel is hand-smeared, Monroe is currently made in limited production and available only at select cheese shops and specialty stores including Whole Foods Markets in the Midwest and Murray’s Cheese Shop in New York City, among a few other local shops. Schuman Cheese introduces Cello Quick Fix and Cello Cheese Flights. 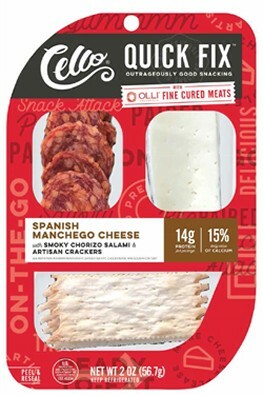 New Cello Quick Fix snack packs make snacking effortless with portioned combinations of savory, award-winning Schuman Cheeses, Olli Salumeria’s artisan slow-cured salami and artisan crackers. Flavor pairings include Asiago Cheese with Spicy Calabrese Salami and plain crackers; Fontina Cheese with Genoa Salami and black pepper crackers; Sharp Cheddar Cheese with Soppressata Salami and rosemary crackers and Spanish Manchego Cheese with Smoky Chorizo Salami and plain crackers. Each 2-ounce pack delivers 14 grams of protein per serving, along with at least 10% of the recommended daily calcium intake. The snack packs are offered in caddies with four of the 2-ounce packages or shippers with nine of the four-pack caddies. The new Cello Cheese Flights feature a trio of curated cheeses with recommendations for complementary beer and wine pairings. The cheeses are: Cello Copper Kettle, the only U.S. parmesan made using a traditional copper vat for a one-of-a kind, award-winning flavor, as well as two award-winning cheeses from the Yellow Door Creamery brand: Gruyere-style cheese and Tuscan Rubbed Fontina. The Cello Cheese Flights come in packs of 14 10-ounce trays. 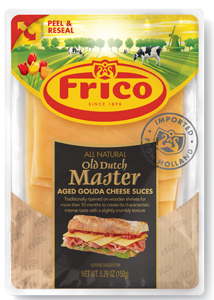 FrieslandCampina is rolling out new cheese products under the Frico brand. FrieslandCampina is a company rich in heritage with a history of dairy products across the globe for decades and in the U.S. for more than 50 years. The new products include Gouda Snack in convenient 20-gram portions packed eight to a bag, Shaved Goat Cheese in a 4.2-ounce cup, a line of Cheese Slices in easy peel-and-reseal packaging in case-ready display packs for easy merchandising, and a line of Cheese Loaves featuring Gouda, Maasdam, Emmental and Goat Cheese for behind the counter slicing. In a move aimed squarely at bolstering consumer convenience, LaClare Family Creamery is expanding its offerings with sliced goat cheeses. 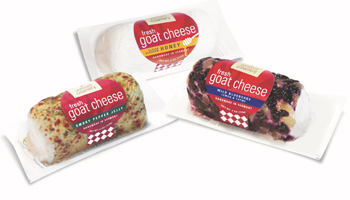 The family-operated farm--a leader in making hard- and aged-goat cheeses--now offers Cheddar, Mozzarella and Jack varieties in peggable packages containing six 1-ounce slices. The 700-goat farm--a multi-generational enterprise operated by two generations of the Hedrich family--is known for producing award-winning goat cheese, yogurt and fluid milk. 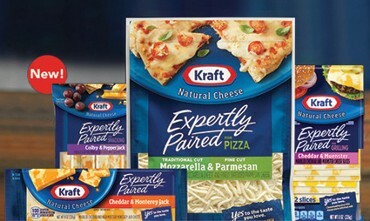 Kraft Heinz introduces Kraft Expertly Paired cheeses. The new brand of cheese comes in multiple forms and cheese combinations. There’s one 8-ounce chunk of marbled Cheddar and Monterey Jack. The 8-ounce slice package contains 12 slices of either marbled Cheddar and Muenster or Double Cheddar (white and orange). Snacking sticks (10 to a 7.5-ounce package) come in marbled Mozzarella and Cheddar and marbled Colby and Monterey Jack. Shreds come in 8-ounce packages in four combinations with suggested applications as part of the descriptor. Mozzarella and Cheddar is for mac & cheese and casseroles. Cheddar and Asadero is for tacos, while Mozzarella and finely cut Parmesan is for Pizza. With a resurgence in the popularity of egg dishes, Cheddar and Swiss is intended for eggs, omelets and quiches. 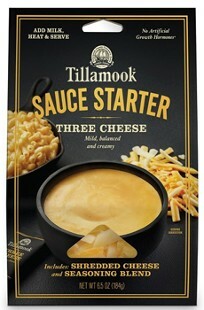 Sauce Starter is a 6.5-ounce package of shredded cheese with a packet that contains seasonings and other saucy ingredients, namely emulsifying and stabilizing agents. The consumer combines the cheese and dry mix with one cup of cold 2% milk. The mixture should be stirred over medium heat until the cheese melts. It makes 1.5 cups of sauce. The package has a suggested retail price of $3.99. Eggland’s Best introduces new snack packs. More and more consumers (34%) are eliminating big breakfasts and replacing it with a small morning meal, followed by a “second breakfast” snack. Two-thirds (66%) of consumers say they find breakfast snacks appealing. Overall, snacks in general are being consumed more throughout the day, with 14% of consumers admitting that they consume five or more snacks each day, up from 11% just last year. 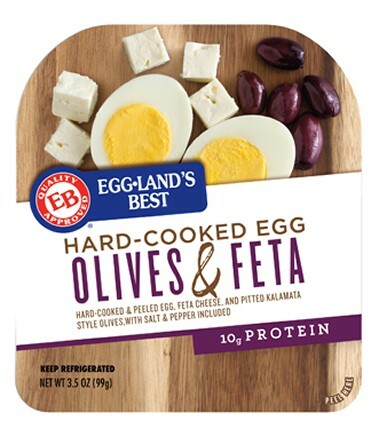 To meet this growing need, Eggland’s Best introduces Eggland’s Best Snacks. This new line contains a nutritious Eggland’s Best hard-cooked and peeled egg, along with cheese and one other food in a portable and convenient snack tray. 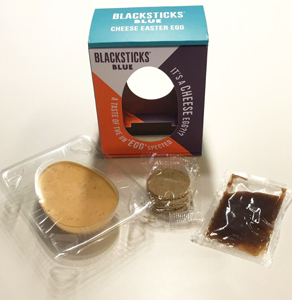 The four unique combination snack packs are one egg with: Bacon and Cheddar Cheese, Chocolate-Covered Almonds and Cheddar Cheese, Olives and Feta Cheese, and Salame and Provolone Cheese. A single-serve pack contains 10 to 20 grams of protein and sells for about $3.29. Compared to ordinary eggs, EB eggs contain six times more vitamin D, 25% less saturated fat, more than double the omega-3s, 10 times more vitamin E, and more than double vitamin B12. EB Eggs are also an excellent source of vitamin B2 (riboflavin) and vitamin B5. EB’s superior nutrition is due to its proprietary all-vegetarian hen feed that contains healthy grains, canola oil and a wholesome supplement of rice bran, alfalfa, sea kelp and vitamin E.
Finlandia Cheese introduces seven varieties to the U.S. market. 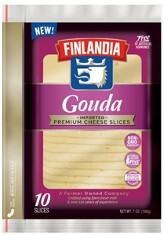 Finlandia Cheese is a subsidiary of Valio Ltd., and has been importing cheese to the U.S. since the 1950’s. The seven imported flavor-packed varieties are: Cheddar-Gruyere, Edam, Gouda, Havarti, Muenster, Light Swiss and Swiss. New Finlandia Imported Cheese Slices are made from non-GMO ingredients and milk from cows free from artificial growth hormones. They are a great source of protein and calcium and are naturally lactose free, according to the company. Ten slices of cheese are packaged in convenient easy-to-open and resealable 7-ounces pouches and have a suggested retail price of $3.99 to $4.49. Schuman Cheese introduces Cello Grab & Go. 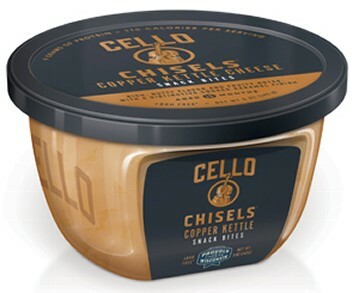 This premium-positioned product is the company’s most revered Cello cheese flavors sold in four packs of individual portions. The cheeses are designed for on-the-go snacking, salads, pastas, sandwiches and cheese boards. The Shaved Aged Parmesan comes in 0.75-ounce containers. 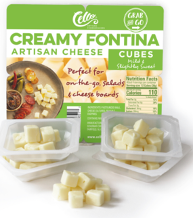 The Sliced Dutch Gouda, Cubed Creamy Fontina, and Sliced and Cubed Sharp Cheddar come in 1-ounce containers. All of these cheese have a 120-day refrigerated shelflife. For more information on this product, link HERE to the April 13, 2018, blog titled "Next-Generation Cheese Innovations." Dairy Farmers of America introduces Borden Hispanic cheeses. Quesadilla cheese. This rich and creamy melting cheese comes in slice and shred form. Use it to create authentic quesadillas or cheesy dips or try it on nachos or huevos rancheros. Oaxaca cheese. This semi-soft cheese has a salty flavor and is a similar texture to mozzarella. It comes in slice and shred form. Oaxaca cheese is best served with enchiladas, burritos or as a topping on soup. Queso Fresco. The name means “fresh cheese” in Spanish. It has a mild and creamy taste and is often used to balance the flavor in spicy Mexican dishes. It is a crumbling cheese that serves as a topping on tacos, salads, soups and grilled vegetables. Vermont Creamery adds three new fresh goat cheese flavors to its growing lineup of high-quality cheeses and butter. With a focus on unique flavors and high-quality ingredients, Vermont Creamery is heading to market with the first round of new 4-ounce chèvre logs: Clover Blossom Honey, Wild Blueberry Lemon & Thyme and Smoky Pepper Jelly. Inspired by the beloved pairing of fresh goat cheese and honeycomb, Clover Blossom Honey chèvre combines Vermont Creamery’s fresh chèvre and pure, liquid honey produced in North Dakota. The tart, creamy chèvre is blended with honey for a subtly sweet, floral flavor. Blueberry Lemon & Thyme chèvre is made with dried wild blueberries that are satisfyingly sweet and bursting with flavor. Taking inspiration from a traditional blueberry lemon cake, candied lemon peel adds tartness and the savory spice of thyme complements the sweetness of the berries. Sweet meets heat in the new Smoky Pepper Jelly flavored log. A twist on an American classic-- coupling creamy fresh chèvre and sweet and smoky pepper jelly—this log is hand-rolled in a rich dry rub that boasts flavors of poblano peppers and hickory smoke. The trio of new flavors join the existing lineup including: Classic, Herb de Provence, Cranberry, Orange & Cinnamon and Three Peppercorn. Applegate’s new all-natural cheeses speak to consumers’ desire for clean label and transparency in manufacturing. Applegate, a leading U.S. natural and organic meat brand, is progressing its core values of taste, truth and transform with the launch of a new natural cheese line hitting stores this April. These new offerings reflect the brand’s mission--Changing The Meat We Eat--by raising standards in cheese sourcing and production, as they have done with meat for 30 years. Naturals Sliced and Shredded Cheese is made with a transparent, traceable milk pool sourced from pasture-raised cows on independent farms in the Midwest. The cows are humanely raised and never administered antibiotics or growth hormones, and the cheese has no added colors or artificial ingredients. 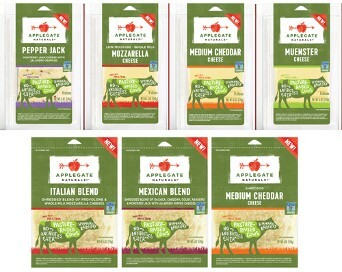 Applegate is also proud to officially announce its first-ever Non-GMO Project Verified cheese. The new line includes six sliced varieties, including a proudly not-processed American-Style Colby, as well as Medium Cheddar, Provolone, Muenster, Pepper Jack and Mozzarella. There’s also three shreds. They are: Italian Blend, Medium Cheddar and Mexican Blend. Swiss is slated to debut in 2019. The suggested retail price is $4.99 per package. For more information on this product, read the March 9, 2018, link HERE to the blog titled "Innovation Knows No Limits at Expo West 2018." Recent statistics revealed 60% of Brits would choose cheese over chocolate, so the U.K.’s Asda responded by creating a confection to appeal to these cheese fans. Debuting in a few weeks in the U.K., Asda’s new savory Easter basket treat contains a half egg-shaped cheese piece (172 grams), along with a pack of mini oatcake crackers and a packet of caramelized onion chutney. This cheesy twist on an Easter classic is crafted using Blacksticks Blue Cheese. It is made using freshly sourced local milk and traditional Farmhouse Dairy methods. In addition to being a basket filler, the new CheEaster Egg makes a great hostess gift. 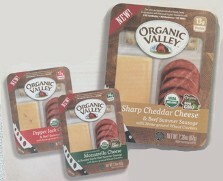 Organic Valley enters the snack kit category. Each single-serve snack kit contains 13 or 14 grams of protein. The company says this is the first line of organic snack kits for adults. Président is launching a range of new cheeses in 2018. Président is a French dairy brand owned by the Laval-based Lactalis company. The brand was created in 1968 by André Besnier. Marinated Feta Cubes in Olive Oil, Herbes de Provence and Pepper Medley flavors. 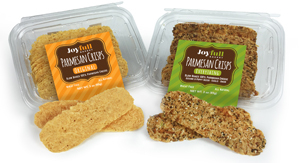 Emmi Roth introduces new cheese snacks. 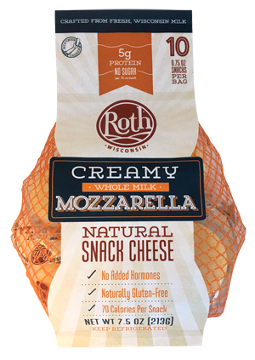 The company is rolling out three varieties--Cheddar, Gouda and Whole Milk Mozzarella—of Roth Snack Cheese. Available in 6- and 10-count bags, each 0.75 oz. round portion is crafted from milk free of artificial-growth hormones and preservatives. One snack contains 70 calories and 5 grams of protein. 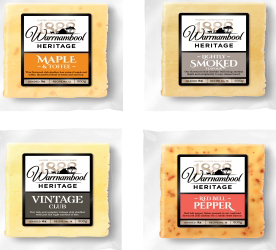 Warrnambool Cheese & Butter released the Heritage Flavours range. The Aussie cheese company debuted Vintage Cheddar, Lightly Smoked Cheddar, Red Bell Pepper Cheddar and Maple & Toffee Cheddar in 200 gram blocks. When creating the new varieties, the company took into consideration the science behind contrasting flavor combinations. Maple & Toffee flavored cheddar is a blend of sweet and savory, while the red bell pepper flakes pressed into the matured club cheddar provides a more subtle spicy sweetness in the Red Bell Pepper Cheddar variety. The Lightly Smoked Cheddar has a smoky depth and complexity. The classic Vintage Cheddar is both rich and complex.